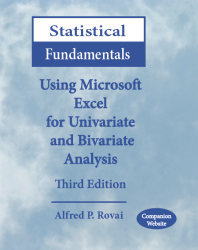 Announcing the revised and expanded Third Edition of Statistical Fundamentals: Using Microsoft Excel for Univariate and Bivariate Analysis by Alfred P. Rovai, Ph.D. The purpose of this revised third edition is to provide users with knowledge and skills in univariate and bivariate statistics using Microsoft Excel®. Bivariate statistics are especially useful in comparing two variables and discovering relationships. The book includes step-by-step examples of how to perform various descriptive and inferential statistical procedures using Microsoft Excel's® native operators and functions as well as automated procedures using Microsoft Analysis ToolPak® and AnalystSoft StatPlus®. This almost 500-page book is offered at the low price of $29.95 for the paperback version and only $9.99 for the Kindle edition. Fred Rovai, a native of San Jose, California, received a BA degree (mathematics) from San Jose State University, a MA degree (public administration) from the University of Northern Colorado, a MS degree (education) from Old Dominion University, and a PhD degree (academic leadership) from Old Dominion University. He also completed postgraduate work in systems management at the University of Southern California and possesses a postgraduate professional license in mathematics from the Commonwealth of Virginia. Following his retirement from the U.S. Army as a dean at the Joint Forces Staff College in Norfolk, VA, he served as Visiting Assistant Professor at Old Dominion University and then as Assistant Professor through tenured Professor at Regent University. He retired in December 2011 as Associate Vice President for Academic Affairs at Regent University. During his career in academe he authored or co-authored seven textbooks and more than 60 articles in scholarly journals and served on four editorial review boards. He presently writes, consults, and serves as an adjunct professor teaching research design and statistics courses online.